Living one's whole life in the past is never a good thing, but it doesn't hurt to spend a little time harkening back to the roots of our fine hobby of aeromodeling. 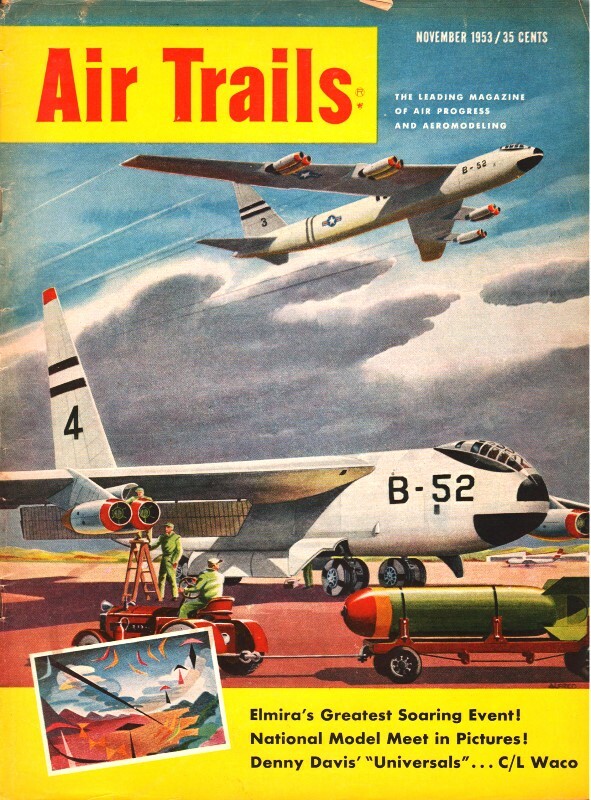 One of the most readily accessible venues is vintage magazines like American Modeler, Air Trails, etc. Looking at the of the old advertisements really brings back memories of the items I drooled over as a kid. $6.95 for a Space Bug isn't much in 2015 money, but according to the BLS's Inflation Calculator, that amount was equivalent to $61.10 in 1953. A newspaper delivery boy's pay made such purchases a little difficult, and my parents certainly were in no position to buy stuff for me. Just think! 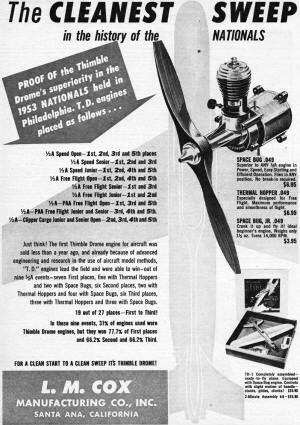 The first Thimble Drome engine for aircraft was sold less than a year ago, and already because of advanced engineering and research in the use of aircraft model methods, "T.D." engines lead the field and were able to win - out of nine 1/2A events - seven First places, five with Thermal Hoppers and two with Space Bugs, six Second places, two with Thermal Hoppers and four with Space Bugs, six Third places, three with Thermal Hoppers and three with Space Bugs. 19 out of 27 places - First to Third! 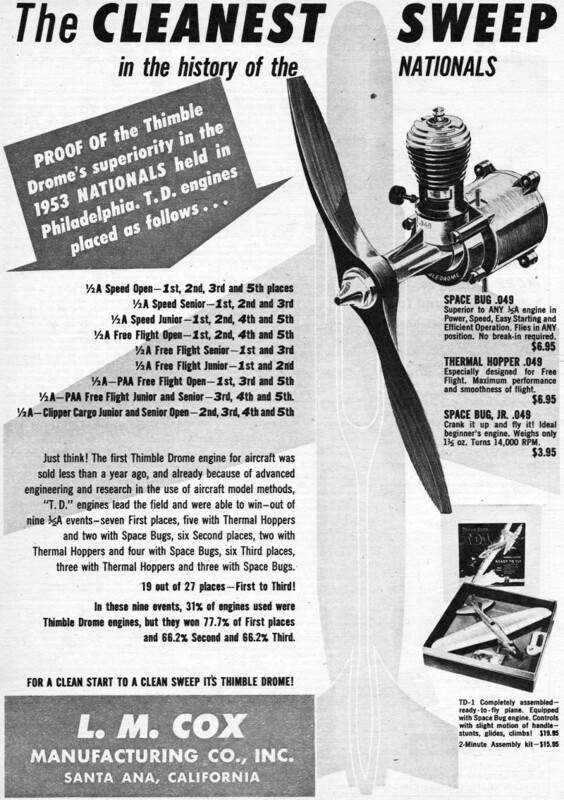 In these nine events, 31% of engines used were Thimble Drome engines, but they won 77.7% of First places and 66.2% Second and 66.2% Third. Superior to ANY 1/2A engine in Power, Speed, Easy Starting and Efficient Operation. Flies in any position. No break-in required. Especially designed for Free Flight. Maximum performance and smoothness of flight. Crank it up and fly it! Ideal beginner's engine. Weighs only 1 1/2 oz. Tums 14,000 RPM. For a Clean Start to a Clean Sweep it's Thimble Drome! L. M. Cox Manufacturing Co., Inc.